I suppose it's possible that this is just a chyron error designed to make everyone's inner eight-year-old eject torrents of milk from their nostrils, but I suppose there's also a chance this could be real. Real as in the poor Tulsa, OK metropolitan area served by the intrepid reporters of Fox 23 is being inundated by rivers of icy mucous. 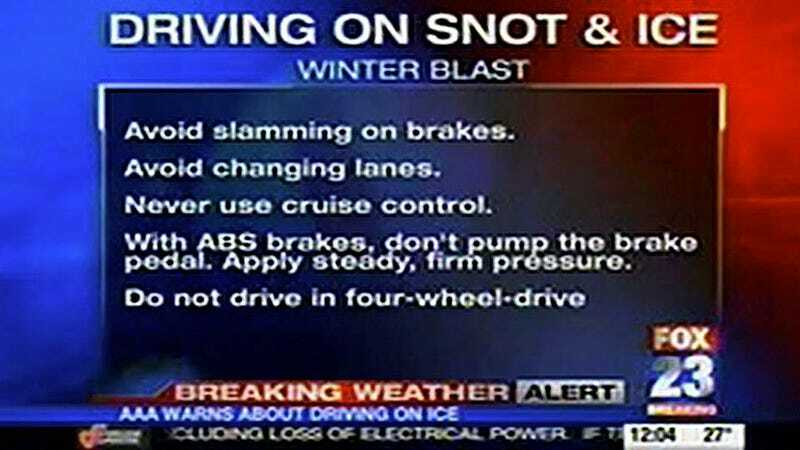 Even if it is just a mistake and they meant "SNOW" instead of "SNOT" (which I doubt) that doesn't make their driving advice any less valid. All these rules apply equally well to frozen water vapor or nose-effluvia equally well: don't slam on brakes, avoid lane changes, don't pump your ABS brakes. Sage advice either way. Actually, I think the 4WD rule doesn't apply to snot— that stuff is both sticky and slippery at the same time, and I think 4WD could prove handy in many situations where, say, your left wheels hit a patch of slick, early-cold post-nasal drip type runoff and the right side is hub-deep in thick rich, green late-cold snot. You'd want at least a limited-slip diff to help you power out of that mess. Also, and this is important to remember, SNOT DOES NOT MELT. You can wait out snow, but for really huge snot drifts, you'll need to rub Mucinex on your tires and wait for the snot-eating birds (gulls, pigeons, some less-discriminating crows) to clean up the mess. Or maybe a dog. I bet your dog wouldn't mind helping out. They love disgusting piles of things.